The College of Textiles at North Carolina State University in Raleigh is one of the nation's most well known colleges. 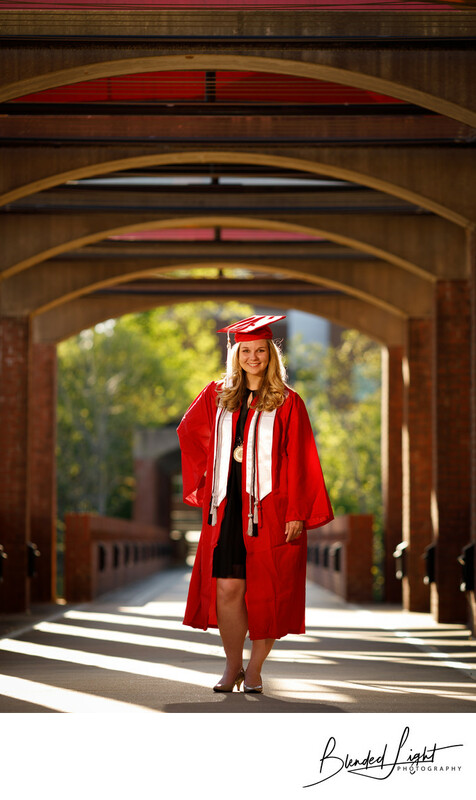 It is also a great location to do senior portraits for those graduating from the college! The surrounding area of the college is beaming with beauty, both natural and architecturally. Whether you choose the shores of the nearby lake, the inside of Hunt library or the outdoor areas between the buildings, seniors are sure to find beautiful and inspiring locations for their portrait session. If you're willing to drive a little ways, you can be on NCSU's main campus in a matter of minutes. The beauty of main campus is a bit shocking given that the university is near downtown Raleigh. Large trees dot the walkways with flowers blooming at every turn. The design of the campus's many building are brimming with opportunities for capturing the blend of both traditional and modern design. It seems around every corner, there's a new spot of beauty just waiting to be used. Pretty generous description of State's campus coming from a Carolina fan, right? For this image, we chose a walkway that spanned a ravine near the College of Textiles. Sunlight was bright and plentiful, coming in from left to right as it began to fall below the horizon. I positioned my graduate just outside the shadows of the partitions with her back facing towards the sunlight to give her a glow along her shoulders and in her hair. I then positioned a single flash to the camera's left to provide light to bring her out of complete shadow and modified the light with a MagMod Sphere and grid to direct the light to her face and upper body. I love the way that the shadows on the ground all point to her and the symmetrical framing from the columns and arches seem to rise as they approach her. I also love that she took a casual feel to this image. By leaving her gown unzipped, she was able to display her collegiate honors, while looking relaxed and confident. It was such an honor to work with this graduate on her portraits on this warm April day and her gallery was loved by all who viewed it! Location: College of Textiles, North Carolina State University, Raleigh, NC 27695-7901. 1/320; f/2.5; ISO 50; 135.0 mm.